The Permanent Committee of Scholars, Al-Lajnatu Ad-Daa'imah, was asked regarding the use of credit cards, so they answered, "Credit cards are a new production from the works of the people of Ribaa and is from the way of eating the wealth of the people with no right, causing them to fall in to sin and corrupting their transactions and earnings. This is similar to the ribaa of Jaahiliyah, pre-Islamic ignorance (to pay on time or pay interest later), which is haraam in this purified religion. So because of this, it is not permissible to produce these cards nor have transactions by them, wa biliahi At Tawfeeq, and success is from Allah. Sheikh Ibn Uthaymeen, may Allah have mercy upon him, was asked regarding credit cards, so he said, "It is a transaction that is haraam, the reason being that it is an agreement built upon ribaa. Even if he where to pay before the deadline, he has still agreed to ribaa, so this haraam." Sheikh Bakr Abu Zayd, may Allah Have mercy upon him, said after a long research study regarding credit cards, "The summary is that credit cards in all its types: Visa, American Express, MasterCard, or other than them is a dealing of ribaa." The Sheikh also mentioned that it a transaction built upon working together upon sin and transgression and it is based upon deception. Sheikh Albaani, may Allah have mercy upon him, was asked about credit cards, so he replied, "The end result of these cards is ribaa." In that same tape, the questioner mentioned that he asked Sheikh Abdur Razaaq Al-'Afeefee the same question and he replied, "These cards are interest based." Refer to tape number 304 of silsilatul Huda wan noor. Also from those who said that possessing such cards are haraam, are Sheikh Muqbil bin Haadee and Sheikh Yahyaa Al Hajooree. 1: Falling into what is transgression in which Allah has prohibited by having ribaa transactions and coporating upon sin with those whom eat from Ribaa. 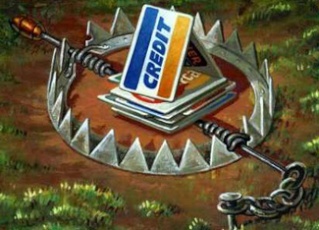 2: Deception in which the card contains of value that is from your earnings. 3: Causing one to become bankrupt or to be overwhelmed by his debts because when he delays paying the payments on their deadlines, late payment fees are due upon him with the amount of money that he borrowed initially. 4: Also it is unsafe where it can easily be stolen and taken advantage of. 5: These cards lead to economy problems. 7: You are charged to pay a fee for membership, where it is not permissible to charge when giving a loan because every loan that comprises of benefit for the loaner is ribaa. 8: The only goal behind these cards is the interest.